18V ONE+™ TRIMMER/SWEEPER/HEDGE COMBO is rated 4.7 out of 5 by 65. Rated 5 out of 5 by money bags from NO MORE CORDS TO HANDLE OR CUT WHEN TRIMMING I just purchased this a week ago as I have several (eleven to be exact) bushes to trim and take care of in my yard and they were all pretty well grown out. It was a pleasure to trim and cut them this time with my new Ryobi. We have about a 3/4 acre and it took a lot of cords to get them cut with the electric trimmer, but without dragging the cords around it didn't take me too long to cut them. The Ryobi is very quiet and smooth cutting and easy to handle. It never stopped on me once. It was easy to angle it to make my bushes round. I am very glad that I purchased it and I will never go back to the electric again. Thanks for making such a sleek, fast acting and smooth cutting trimmer. Rated 5 out of 5 by Bijo007 from Interchangeable battery with my other drills and s I have a drills and saws from ryobi and they work great. Rated 5 out of 5 by DAP18 from Tried & True!! This is my second Ryobi 18V P2105 Blower. Although we have the pack pack for large areas this is my favorite blower. It is simple, lightweight and powerful for its size. It is perfect for clearing the driveway, sidewalks and curbs after mowing. I love it. Back pack is great but I really prefer this blower. Just bought my second on on September 15th, 2018. My first one died, my fault. I cried and promptly ordered a new one YEA!! You can not go wrong with this blower. True, it is not for large jobs but works great on everyday clean up. Thanks Ryobi!!! Rated 5 out of 5 by Theovo from Great combo for a great price. This was my gateway purchase into the Ryobi One+ world. My gas-powered blower and trimmer we just too much machine for how infrequently I used them. The Ryobi set is perfect for edging and trimming, as well as blowing off the driveway after I'm finished. The hedge trimmer was a bonus I didn't really ever think I would use, but boy was I wrong. Three tools, two batteries and a charger were included in this package, which was an incredible value. Very please with this purchase. Rated 5 out of 5 by Rbpeeps from Great Set I had this set bought for me 2 years ago as a Father's Day gift and have to say I am thoroughly pleased with all three pieces of equipment. If I had anything I could change at all about the set, is perhaps for the leaf blower to have a little bit more power, but it does the work I need very well. We have about a 1/4 acre yard, previously battling with a corded weed eater, never will I go back! This way my first Ryobi purchase and I guarantee will not be my last. Rated 5 out of 5 by BoltonPaul from Powerful for the home Although the tools are only a month old, I have used them around my home without any problems. They seem strong enough for the regular duties around a house and the battery seems to last pretty long. On a single charge I was able to trim all my grass which usually took two charges of my previous B&D trimmer. The blower is not as strong as I thought but does the job well. The hedge trimmer works great as well. No complaints and the price is reasonable. Rated 5 out of 5 by vanessabella from Awesome Combo Package I bought the combo with the trimmer/sweeper/hedge and it is so nice not dealing with cords. They are super light weight and the batteries last longer then I expected. I ended up having to buy another hedge trimmer because the other one lasted so long. I bought the same one that came in the combo and it works awesome!! 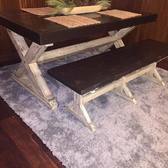 Super happy with my Ryobi purchase! Highly recommended. For the perfect union of convenience and versatility, nothing beats the Ryobi ONE+ system. This ONE+ Combo Kit provides you with all the tools to make your yard look spectacular this season. It includes the One+ Trimmer/Edger, Hedge Trimmer, Blower/Sweeper, 2 Compact Lithium-ion Batteries and a Charger. 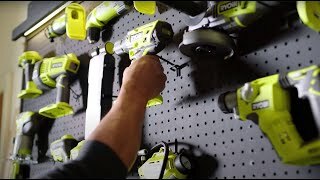 As part of the Ryobi One+ system, this kit works with all Ryobi One+ tools. That's over 50 products running off the same battery. This One+ Combo Kit is ideal for anyone who's tired of dealing with gas and cords. All backed by a 3-year warranty, look to Ryobi for performance and versatility. String Trimmer Cutting Width: 10-12 in. Hedge Trimmer Cut Capacity: 3/8 in. 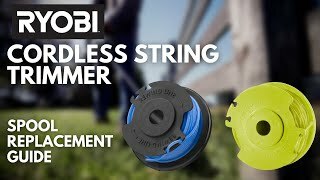 How do I manually advance the line on my RYOBI Cordless String Trimmer? Push the black button located on the string head while pulling on the line to manually advance the line. 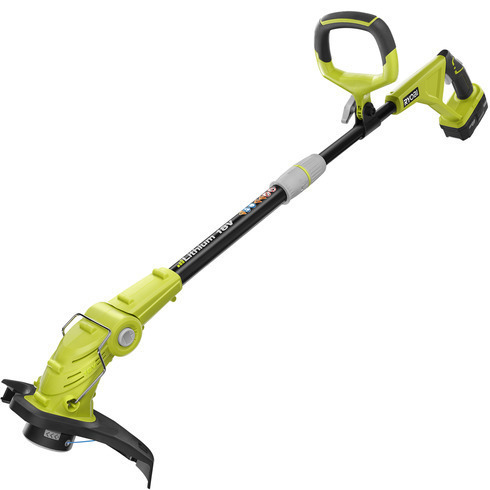 How do I replace the line on my RYOBI Cordless String Trimmer? Remove the spool from the string head. NOTE: Remove any old line remaining on the spool. Cut a piece of line approximately 9 ft. long. Use only .065 in. round or .080 in. twisted monofilament line. Insert the line into the anchor hole in the upper part of the spool. Wind the line around the supper part of the spool clockwise, as shown by the arrows on the spool. Place line in the slot on upper spool flange, leaving about 6 in. extended beyond the slot. Do not overfill. After winding the line, there should be at least ¼ in. between the wound line and the outside edge of the spool. Replace the plastic retainer spool and the spool cap.